Sen. Tom Cotton (R., Ark.) said Russia, Iran and the Bashar-al Assad regime in Syria must all "pay for their barbarism" Sunday after reports of a chemical weapons attack in a Damascus suburb. The attack on rebel-held Douma reportedly left dozens dead, and it was almost exactly a year after a similar chemical attack by the Assad regime that led President Donald Trump to order a retaliatory missile strike to destroy a Syrian air base. 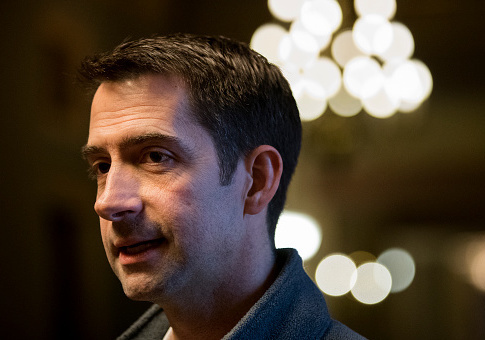 Cotton said Russia and Iran, who both support the Assad dictatorship, had to be held to account. "As the sparrow cannot fall without the Father, so too Assad cannot launch chemical attacks without Iran and Russia. All three should pay for their barbarism," Cotton said in a statement. Trump warned of a "big price to pay" for the attack in a tweet Sunday morning, specifically condemning Russian President Vladimir Putin for supporting the "animal Assad." He also hit the Obama administration for not enforcing its "red line" in 2013 when Assad used chemical weapons then. Assad has denied responsibility for the attack. This entry was posted in National Security and tagged Bashar al-Assad, Iran, Russia, Syria, Tom Cotton. Bookmark the permalink.